Spring is upon us and normally with spring comes an abundance of pasture. Pasture is the most economical and most ‘natural’ feedstuff you can provide for your horses and it is an exceptional source of digestible energy (calories) and protein. In fact, current improved pastures can provide young horses and broodmares close to 100% of their daily requirement for digestible energy and protein, representing a huge cost saving in supplementary feed. But unfortunately, it is not all roses. Lurking in your pastures there are almost certainly mineral deficiencies and imbalances that are capable of disrupting the mineral balance in a horse’s diet to such an extent that the risk of reproductive and developmental issues is significantly increased. While these deficiencies and imbalances can be largely corrected through proper nutrition, the key to managing them correctly is knowing they exist and the extent to which they exist in the first place. Pasture analysis is a powerful tool that allows us to quickly identify these deficiencies and imbalances. Once they are identified, a supplementary feed regime that will fill gaps left by pasture and rebalance any imbalances can be designed. 77% of pastures sampled were of good to excellent quality from a digestible energy (calorie) perspective containing 8 MJ or more of digestible energy per kilogram of dry matter. To put this into perspective a pasture containing 8 MJ of digestible energy contains enough energy to meet close to 80% of a late-pregnant mare’s daily energy requirement and 65% of a 12-month old, 375 kg yearling’s daily energy requirement when growing at 0.55 kg per day. Sampled pastures, in general, were high in protein. More than 80% of pastures sampled contained more than 12% protein. Again, to put this into perspective, a 12% protein pasture is capable of fully meeting a late-pregnant mares protein requirements without any additional supplementary protein and it will almost meet a 12-month old yearling’s requirement for protein. It should be noted however that the quality of protein contained in some pastures is poor, so even though a pasture can meet ‘crude protein’ requirements there will likely be some essential amino acid deficiencies that need to be corrected via supplementary feed, but that is another story for another day. A majority of pastures sampled actually contained more than 18% protein, with the highest protein recorded being a massive 39%! Because of its role in bone development, calcium is probably the single most important mineral to get right in the diet of breeding mares and growing horses. There was a huge range in pasture calcium levels tested, with 1.4 g/kg of dry matter the lowest recoded and 12.5 g/kg of dry matter being the highest. Pasture needs to contain around 4 g/kg of calcium to be capable of meeting 100% of a late-pregnant mare’s daily calcium requirement. Almost 60% of pastures tested contained less than 4 g/kg of calcium, meaning some calcium supplementation would be required for pregnant mares on a majority of pastures. This level of calcium (4 g/kg) would only satisfy sixty five percent of a 12-month old, 375 kg bodyweight yearling’s optimal requirement for calcium, so again, calcium supplementation is required on most pastures for growing horses. Alongside calcium, phosphorus is also very important for correct bone development. And like calcium, there was a large range in phosphorus across pastures that were tested. The lowest phosphorus tested was just 0.8 g/kg while the highest was a massive 7.3 g/kg. Putting these values into perspective, a pasture would need to contain 3 g/kg of phosphorus to meet 100 % of daily phosphorus requirements of a late-pregnant broodmares. Only 28% of pastures contained less than 3 g/kg of phosphorus, so phosphorus supplementation is only needed on a minority of pastures for broodmares. This level of phosphorus (3 g/kg) would also meet a 12-month old yearling’s minimum phosphorus requirement. This is where we started to see major issues as far as mineral balance is concerned in pastures. As well as looking at total calcium and phosphorus levels it is also important to look at the ratio of calcium to phosphorus in a pasture. An ideal calcium to phosphorus ratio is somewhere between 1.2 parts calcium to 1 part phosphorus (1.2: 1) and 2 parts calcium to 1 part phosphorus (2: 1). If the calcium to phosphorus ratio falls below 1 part calcium to 1 part phosphorus (1: 1)the phosphorus can start to block the absorption of calcium and cause a phosphorus induced calcium deficiency. And here is the scary thing, half of the pastures we tested had a calcium to phosphorus ratio lower than 1: 1 and more than 60% were lower than the ideal ratio of 1.2: 1. That means that at least half of the pastures tested contain so much phosphorus that they are capable of causing a calcium deficiency, and that almost certainly means they will cause developmental diseases like OCD if calcium is not supplemented very carefully. The lowest ratio recorded was 0.26: 1, which will cause severe calcium deficiency and is almost certain disaster when considering the effect of nutrition on the incidence of diseases like OCD. Some observations we have made when looking at the calcium to phosphorus ratio in pastures is that lush, green, rapidly growing pastures, improved pastures and pastures growing on soil with high soil phosphorus levels (more than 100 mg/kg) will normally have the highest levels of phosphorus and the lowest calcium and therefore the worst calcium to phosphorus ratios. Mature, slow growing or browned off pastures typically had very good calcium to phosphorus ratios, even when grown on high phosphorus soils. Because of the seemingly dramatic swings between balanced and unbalanced calcium to phosphorus ratios as pastures grow and mature, a different calcium supplementation strategy may be required depending on the season and maturity of pastures your horses have available. Potassium is one of the major electrolyte minerals, responsible for maintaining hydration and acid-base balance in a horse’s body. Forage is a rich source of potassium and even the lowest tested amount of potassium in a pasture of 5.1 g/kg dry matter is enough to meet 100% of requirements for late pregnant mares and yearlings. The problem we see with potassium is therefore not deficiency, but over-supply! Half of the pastures tested contained more than 30 g/kg of potassium. At 30 g/kg of potassium, over 900% of a broodmare’s and 750% of a yearling’s requirements are met. The highest recorded level of potassium was a massive 68 g/kg. Putting that into perspective, a pregnant broodmare grazing this pasture would be consuming around 680 grams of potassium per day.. that is about half a dipper of pure potassium per day!! Unfortunately not a lot is known about the effect of these amounts of potassium on the absorption and metabolism of other minerals and horse health in general, but based on effects in other animal species it is likely that these extreme levels of potassium will be affecting calcium and magnesium absorption and it will almost certainly be pushing the acid-base balance of the body out of its optimal range. In the opposite trend to calcium, potassium is highest when pastures are lush, green and rapidly growing. Copper is a crucially important mineral for pregnant mares and growing horses. Copper is required for normal cartilage development, foals born to copper deficient mares have been found to have worse physitis scores and are at increased risk of OCD, regardless of whether the foals themselves are supplemented with copper once they are born and copper deficient mares are at increased risk of uterine artery rupture. A horse’s minimum requirement for copper is 10 mg/kg of feed. A staggering 91% of pastures contained less than 10 mg/kg of copper meaning copper deficiency for horses grazing Australian pastures is a major issue. The lowest recorded copper was just 2.7 mg/kg while the highest was 22.5 mg/kg. These pasture analysis results highlight that correct supplementation with copper is essential if you are to have any hope of producing structurally sound weanlings and yearlings. A horse’s minimum requirement for zinc is 40 mg/kg of feed. Not meeting this minimum requirement will potentially cause issues with cartilage and bone development, hoof quality and proper immune function. But get this, 95% of pastures don’t contain enough zinc to meet a horses minimum requirement. More than 20% of pastures don’t even contain half of a horse’s minimum requirement for zinc while the lowest zinc recorded was 9 mg/kg which will provide less than ¼ of the minimum requirement for this essential mineral. In short, zinc is in short supply in Australian pastures and again, correct supplementation of broodmares and growing horses is essential if you wish to produce structurally sound youngsters. Like calcium and phosphorus, copper and zinc need to be present in a diet in the correct ratio to one another. If zinc gets above 5 parts to every 1 part of copper (5: 1) a zinc induced copper deficiency is possible. Almost 20% of pastures tested had a zinc to copper ratio greater than 5: 1 and all of these pastures contained less than the minimum requirement for copper of 10 mg/kg meaning horses grazing these pastures would become severely copper deficient if they are not correctly supplemented. Like copper and zinc, manganese is required for normal cartilage development. Unlike copper and zinc though, deficiency of manganese is relatively rare, with only 13% of pastures containing less than the minimum manganese requirement of 40 mg/kg. Also unlike copper and zinc, we do see very high levels of manganese in some pastures which may interfere with copper absorption. The lowest recorded level of manganese was 24 mg/kg while the highest recorded was 444 mg/kg. A whole host of other minerals including sodium, chloride, sulphur, iron, molybdenum and magnesium are tested as part of the routine pasture analysis conducted. There isn’t the space to discuss all of these minerals here but if anyone is interested you are welcome to contact myself or Pryde’s EasiFeed for details. Lush, green, rapidly growing pastures are the ones capable of providing your horses with the most energy and protein and can often meet requirements for these nutrients without the need for any additional supplementary feed. However, it is also these pastures that tend to be low in calcium, high in phosphorus and potassium and given the widespread incidence of copper and zinc deficiency, more than likely lacking in these minerals too (Figure 1). So the problem is, right when your pastures are least suitable, from a mineral perspective, for breeding and growing horses, is also the time when you are forced to feed the smallest amounts of supplementary feed to prevent your broodmares from becoming obese and to stop your youngsters from growing too quickly. With very little supplementary feed being fed, the pasture begins to have a heavy influence on the nutrition of your horses, and in a lot of cases, because of the mineral deficiencies and imbalances in pasture, this isn’t ideal. Figure 1: This shows a typical lush, green pasture in the diet of a late-pregnant mare with zero supplementary feed being fed. Note that digestible energy (calorie) and protein requirements are easily met, but there are deficiencies of calcium, copper, zinc, selenium and iodine. So how do you get the minerals they need into them, to fill the gaps and rebalance the imbalances caused by pasture, without also blowing the calorie budget? Balancer Pellets! There are a whole host of balancer pellets available that are designed to do exactly this, add to the diet what is missing or imbalanced in pasture without adding excess calories. The problem is, with so many available, how do you know which one will suit your needs? 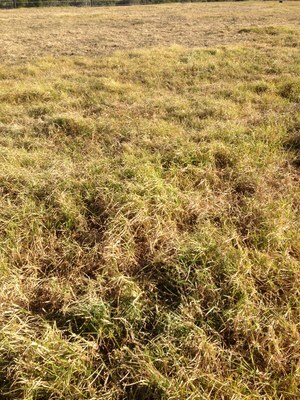 The answer… test your pasture! Then you will know exactly what is missing and/or imbalanced in your pasture and we can help you find or even custom design just the right balancer pellet to match your specific pasture during a specific season. Figure 2: This shows the same pasture but 650 grams per day of a suitable pasture balancer pellet (Pryde’s 150 Pellet in this case) has been added to the diet and is filling the gaps left by the pastures nicely.